The Cash for Clunkers (CFC) program has not just been popular. It has also been effective. It has helped the auto industry. And it has reduced CO2 emissions. Vehicles traded in under the program averaged 15.8 miles per gallon, compared with 25.4 miles per gallon for the new purchases, or a 61 percent improvement, according to the Transportation Department data. Let's translate this into gas saved and CO2 emissions reduced. Holding constant the number of cars is a reasonable assumption: These are trade ins that work one-for-one. Holding constant the miles driven is a more problematic assumption. More fuel efficient cars make it cheaper to drive and people may drive further. Economists call this effect a "rebound" effect (which is an example of a "moral hazard"). How large is the rebound effect? The reality is that most people drive the distance they need--to work, to school, etc--without much opporunity for discretionary driving (The exceptions? "Sunday drives;" vacations that wouldn't have been taken; travel made in a car that would have been taken in a plane). MIT Technology Review reports numbers that the rebound effect is about 20%--for every 10% increase in fuel efficiency, drivers wipe out 2% by driving further. The best guess is that rebound effects are small. It is not clear whether CFC purchasers will be different. That's a savings of 2.4 gallons per 100 miles. If we take into account a rebound effect, that might reduce the net gas savings to roughly 2 gallons per 100 miles. A gallon of gas releases about 20 pounds of carbon dioxide when burned. (In fact, Aaron Seigel has emailed me that the real emissions are closer to 25 pounds because gasoline manufacturing emits carbon--so, a gallon saved eliminates this carbon, too.) Twenty pounds of CO2 translates to one ton of CO2 in 10,000 miles of driving. This improvement alone saves 2 tons of carbon dioxide every 10,000 miles of driving that it replaces in the old vehicle. That is a valuable savings. However, the new vehicle released carbon dioxide as it was made: About 7 tons of carbon. This figure includes materials and manufacturing. (The actual estimates, from the ACEEE, range between 3 and 12 tons.) Do the gas savings need to repay this carbon "debt"? Arguably, the carbon debt is sunk for cars already sitting on lots. However, because cars are also being destroyed, it is more conservative to assume that selling existing cars is accelerating the manufacture and purchase of soon-to-be-made cars--when the lots are empty, new cars will be built that wouldn't have been built otherwise. Thus, we need to "charge" the cars on the lot with some carbon debt. Let's be conservative and use 7 tons of carbon as the debt. How much gas needs to be saved to cover the carbon debt? We have shown in earlier posts (here and here) that saving 2 gallons per hundred miles "pays back" the carbon used to make the new car in about 35,000 miles of driving, which is a reasonable payback time (and modeled on the standard proposed by Bill Chameides, Dean of Duke's Nicholas School). Every additional mile driven in the new car in place of the old car beyond 35,000 miles yields a net reduction in CO2 emissions. What if the clunker was truly a junker and wouldn't have lasted 35,000 more miles? In the extreme, what if the junker couldn't go another mile? Then the key comparison is to the new car that "would have been" purchased without the CFC requirement of an MPG improvement. 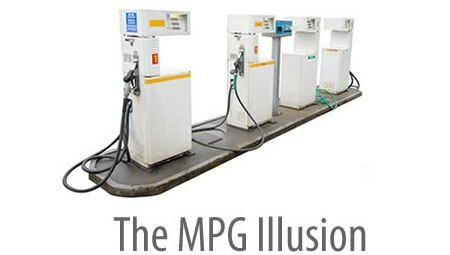 For these situations, the carbon dioxide released manufacturing the new car was inevitable, and the relevant factor is the difference between the MPG of the car bought under CFC and the MPG of the car that "would have been bought" otherwise. Edmunds reports that trade ins of comparable cars yields a 5 mpg improvement on average, well-below the 9 MPG increase observed in the CFC trade ins. (Edmunds does not try to adjust for any self-selection of types of buyers who are taking advantage of this program (e.g., eco-minded buyers who were going to buy a higher MPG car anyway).) For trade ins of junkers, CFC has helped reduce CO2 emissions if the CFC trade in improves on the MPG of the car that "would have been bought." In these earlier posts, we had proposed that "2 GPHM" be the minimum gas savings allowable in a CFC trade in, thereby ensuring that new cars cover the emissions from their production. The original Feinstein/Collins/Irael bill called for efficiency gains that would have met this standard. However, the final June bill had MPG improvements that fell far short of saving 2 gallons per hundred miles. If car buyers had simply met the minimum MPG improvements in the final bill, the program would have failed as a CO2 reduction policy. The good news--the great news--is that car buyers have been happy to ditch their inefficient vehicles (60% of those traded in have been trucks and SUVS) for much more efficient vehicles that have yielded significant savings in gas. Here is a link to the top 10 sellers, listed with gallons per 100 miles. Thus, Feinstein and Collins have praised what car buyers have done with this opportunity and are supporting the extension. The bottom line: CO2 has been reduced. This new fleet will cover its own carbon debt as long as it replaces 35,000 miles that would have been driven in the old vehicles. If the old car would not have made it 35,000 miles, CO2 has been reduced if CFC has encouraged car buyers to improve their MPG by more than they would have without the voucher.